Sometimes, all it takes is one domino. Just one week ago, Georgia Tech provided an improbable escape hatch for Josh Pastner at Memphis, which led the Tigers’ program to quickly move in uprooting well-traveled Tubby Smith from Texas Tech. 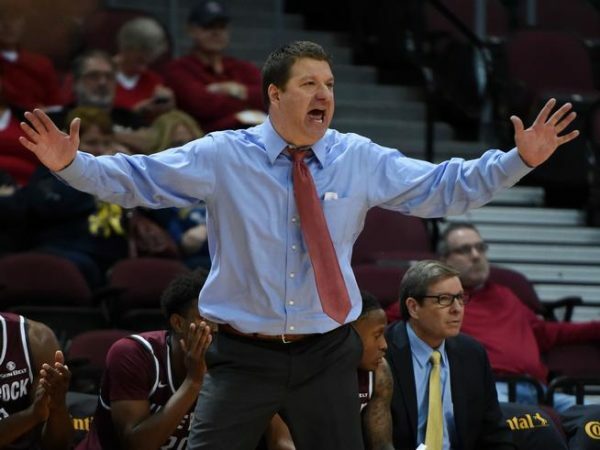 On Friday, the Red Raiders responded by hiring Chris Beard from UNLV. Now, I’m not going to lie and say that Beard is an upgrade from Smith, and time will tell how it works out in the long run. In the short term, however, Texas Tech has emerged from a whirlwind week with only a few scratches when it could have been left bruised and bloodied. Though critics have zeroed in on Beard’s transience by pointing out that this move marks his fifth job since 2011, it is very clear that the Texas Tech position represents something different to him than the three coaches the school has employed in the eight seasons since Bobby Knight retired in 2008. It may not necessarily prevent him from jumping again, but it is important in framing his decision to move. Beard’s daughters live in nearby Abilene and he toiled in Lubbock as an associate head coach under the Knights (Bobby and Pat) for 10 years, the longest he’s worked at a single school since entering the coaching profession in 1991. The fact that UNLV’s program appears to be teetering with leadership uncertainty and a roster that’s been almost completely gutted may have also played a role in Beard’s decision to pull the cord and return somewhere familiar. At Texas Tech, Beard will look to build on the success forged by Smith resulting in a 9-9 record in league play and an NCAA Tournament appearance for the first time in nine years (despite being picked to finish last in the conference in the preseason). Barring significant roster defections, he’ll inherit an experienced team with the potential to crack the top half of the Big 12 standings behind veterans Aaron Ross, Zach Smith and Matthew Temple, as well as intriguing younger pieces like Justin Gray and Norense Odiase. Beard could also be helped by an unprecedented amount of coaching and roster turnover in the conference. Four schools in addition to Texas Tech will have first or second-year coaches at the helm next season, and significant rebuilds are set to take place at Oklahoma, Iowa State and Baylor, three of the conference’s steadiest programs. Generally speaking, the Big 12 will be tough like always, but it may be a degree more navigable than it has been. Coaching is often secondary to talent when it comes to wins and losses, but for the time being, the Red Raiders look to have steadied their program after one chaotic ride on the coaching carousel. This entry was posted on Saturday, April 16th, 2016 at 12:15 pm by Brian Goodman	and is filed under big 12, coaching carousel, microsites. Tagged: aaron ross, Chris Beard, coaching carousel, norense odiase, texas tech, tubby smith, zach smith. You can follow any responses to this entry through the RSS 2.0 feed. You can leave a response, or trackback from your own site.